Our next stop on our Asian adventure was to Malaysia. We didn’t really know too much about the place but had heard good things (particularly about the food) and the cheap flights from Singapore made it an easy decision to get this country into our itinerary. On the afternoon of the 16th October 2017, we arrived into Kuala Lumpur, Malaysia’s capital. We got a bus into the city which took over an hour due to a lot of traffic and then planned what we would be doing during the two and a half weeks we had given ourselves in Malaysia. 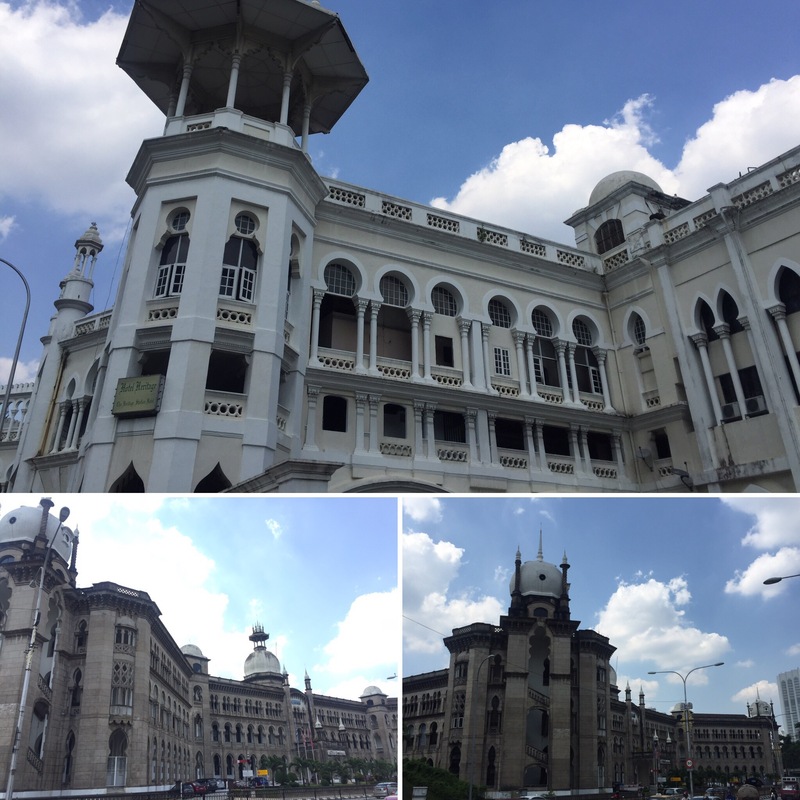 Due to the wet season that was starting on the east of Malaysia, we decided to focus on the west and see as much as we could (we could always come back to the east at a later date after all). 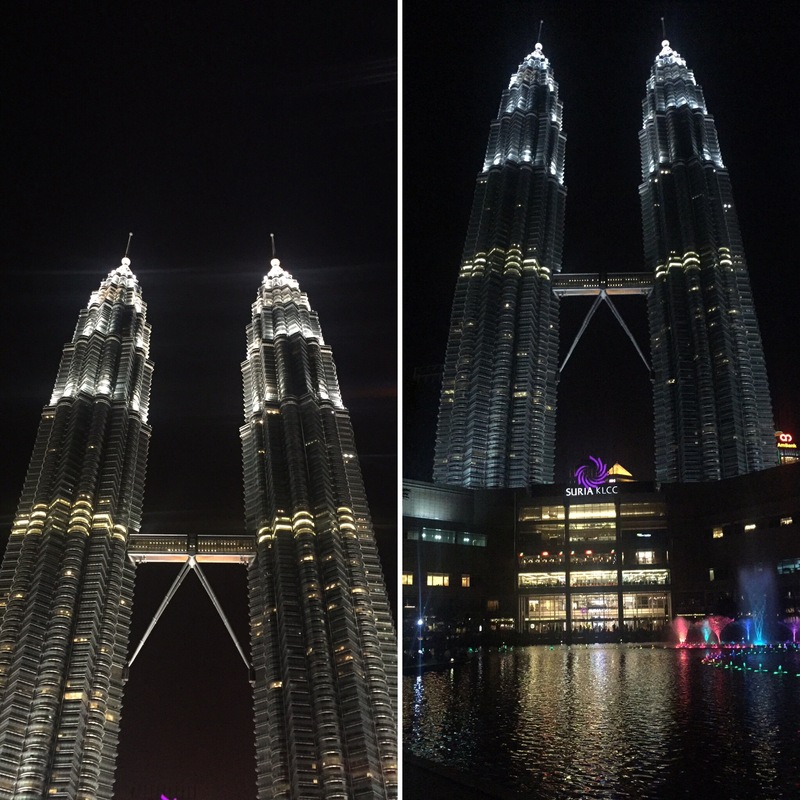 On our first night we went for food at a nearby food hall and then went to see the famous Petronas Towers all lit up. At the bottom of the towers there was also a light and water show which was a less impressive version of the one we saw in Singapore. The tower itself looked great and was almost a silvery, white in the dark night sky lit up so well. They’re very tall and at the bottom of them is a giant shopping mall with great air conditioning for when we got too hot – although, saying that, the nights were a really nice temperature! We spent quite a while sitting and looking up at the towers – it really was a very pretty thing to see. 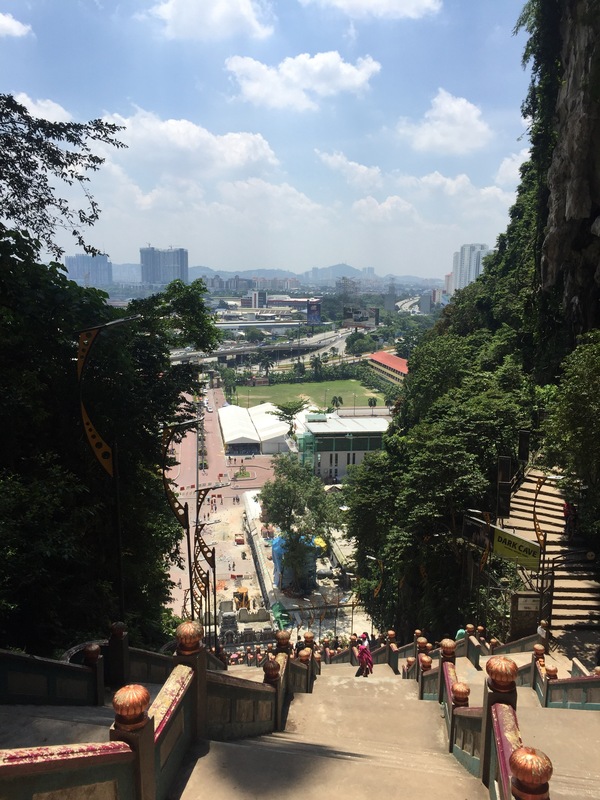 On our first full day in Kuala Lumpur we got the train (more like the metro or underground you’d get at home) to see the Batu Caves. 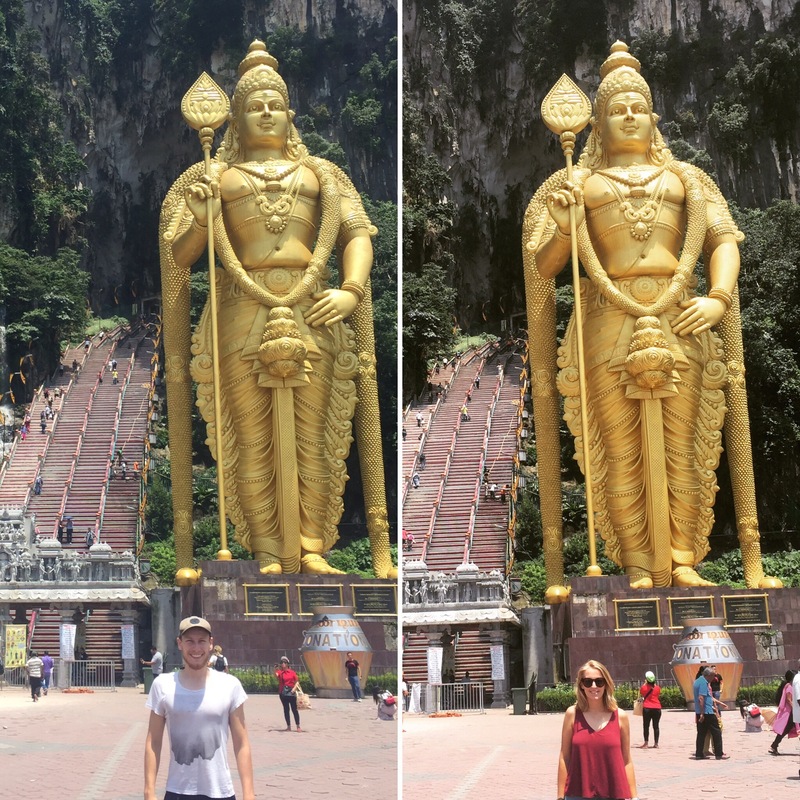 These caves attract people from all over Malaysia as they have a giant gold statue of Lord Murugan. 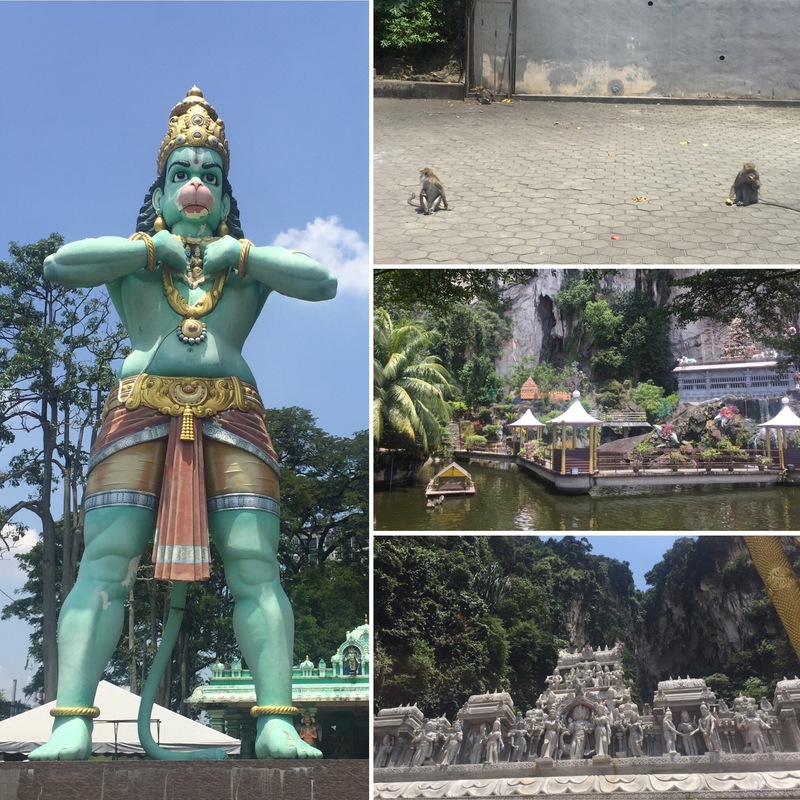 This is the tallest statue of a Hindu deity in Malaysia and the second largest in the world! We had thought it would be very old but it was only made in 2006! It is spectacular due to it being gold and the detail is really precise – although slightly less impressive knowing that they had machines m to help them make it compared to in ancient times. 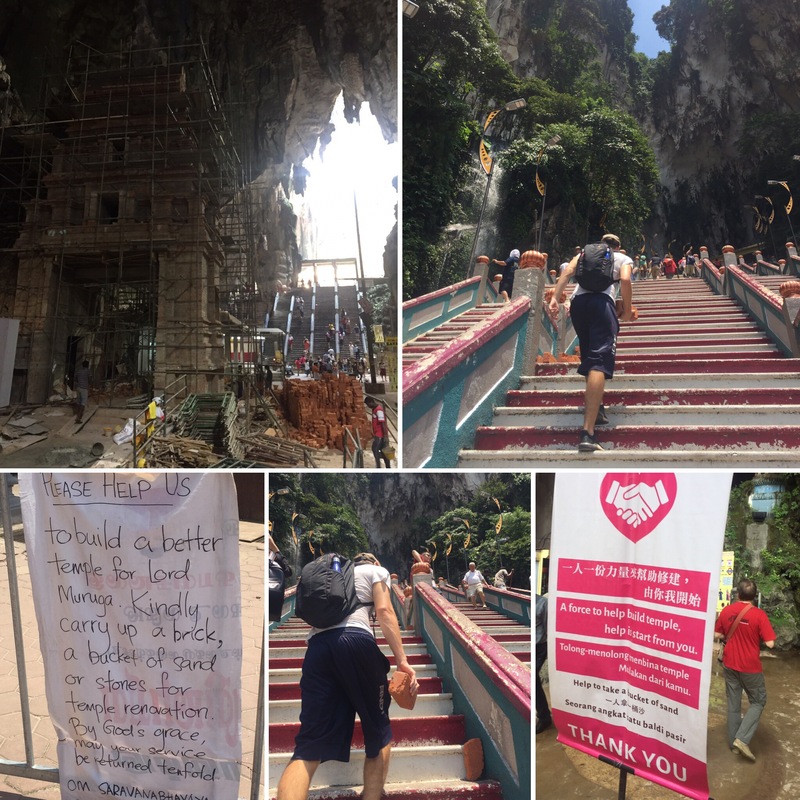 The Batu Caves are up 272 steps and we had unwisely picked the hottest part of the day to climb to the top. The caves are home to a Hindu temple which is still being built at the moment. At the bottom of the stairs their are signs asking if you wouldn’t mind taking up a brick or a bucket of sand to the top of the stairs with you for the builders. We both took a brick (the sand buckets looked really heavy and we weren’t sure how we would find climbing the stairs with the heat as it was). It’s a good idea as it would take forever for the builders to take up the materials they needed and be a waste of labour seeing as so many people climb those stairs everyday. The cave is very big and cool which is what you want after the sweaty stair climb. 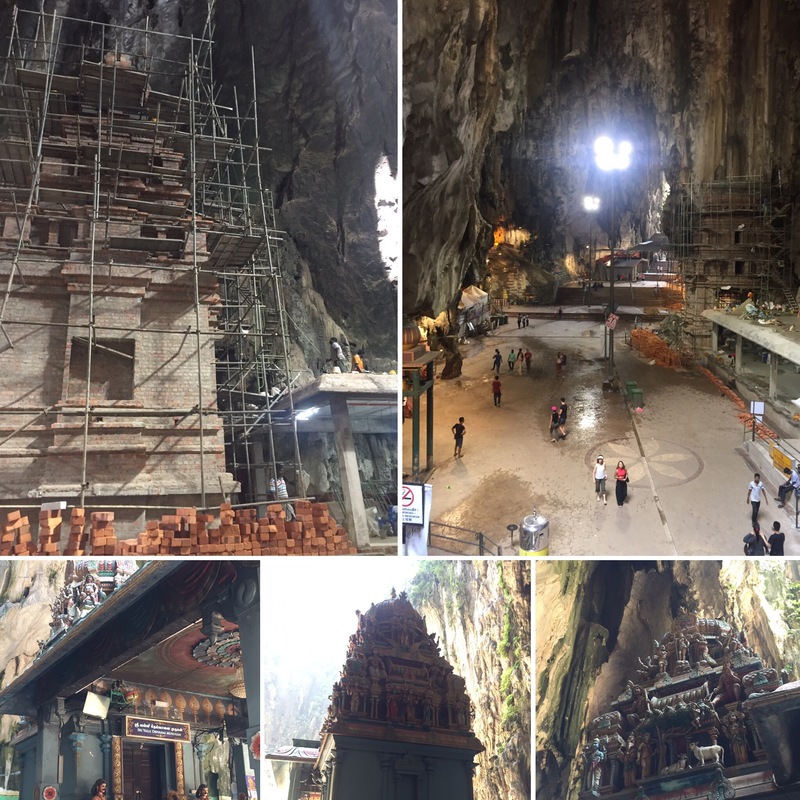 You’re able to walk around the main chamber where the temple is being built and there are a few shrines and other deities up there for people to worship whilst the temple is being built. There are also loads of monkeys up here and we saw one getting fed by a tourist. It was funny because every time it took the food it would look around as if it was waiting to be pounced on by another monkey. They gave us the impression that it maybe wasn’t the boss and that it shouldn’t have been getting first dibs of the tourist’s food! It was really cool to see monkeys again (we had seen them in Bali) as they have funny personalities so are really good to watch for a while – these monkeys even tried to get into someone’s bag! We headed back into the city to the Central Market which is an enormous market selling anything you might need in terms of knock off goods or souvenirs. This place had so much stuff that we spent a good while looking into all the stores and walking around through the maze of small corridors and different floors. There is also an outside area to this market, Petaling Street Flea Market, which is in China Town and sells loads of stuff, particularly good knock off trainers and sunglasses. 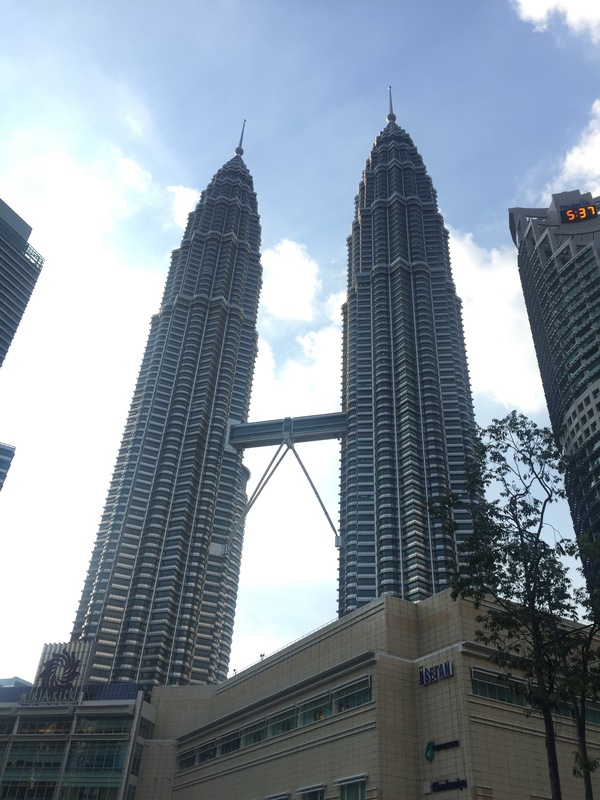 The rest of the day was spent walking around the city including heading back to the Petronas Towers and see what they looked like during the day. 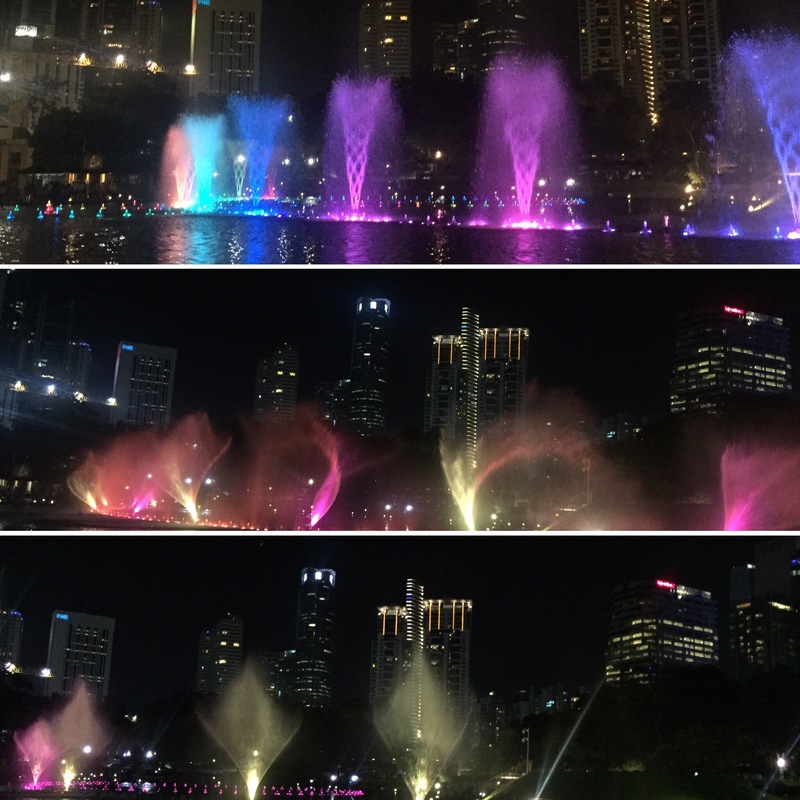 We didn’t find there to be too much to do in Kuala Lumpur (particularly if you’re not going to spend any time shopping) but we had a good time for the couple of days we were there. Our next stop was up to the north of Malaysia to a place called Langkawi Island. 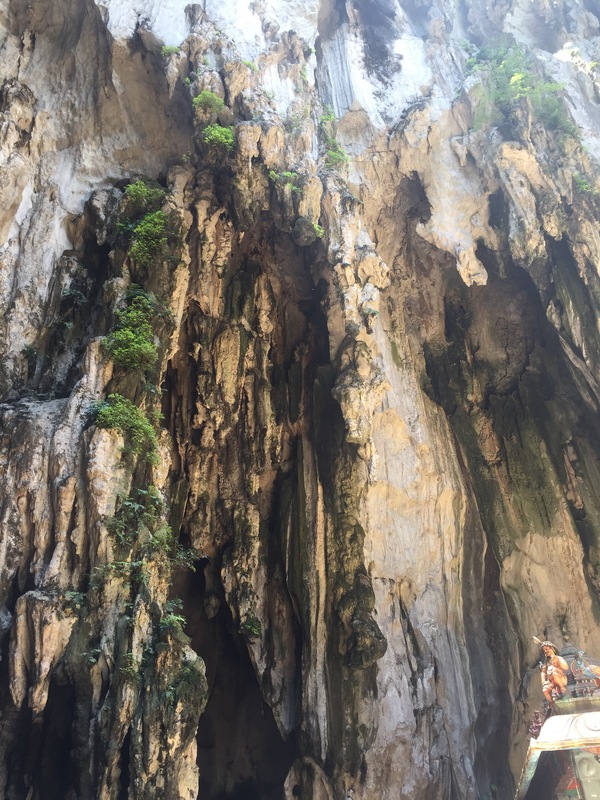 The Batu Caves look so impressive!